This truly is: 'comfort under canvas'. 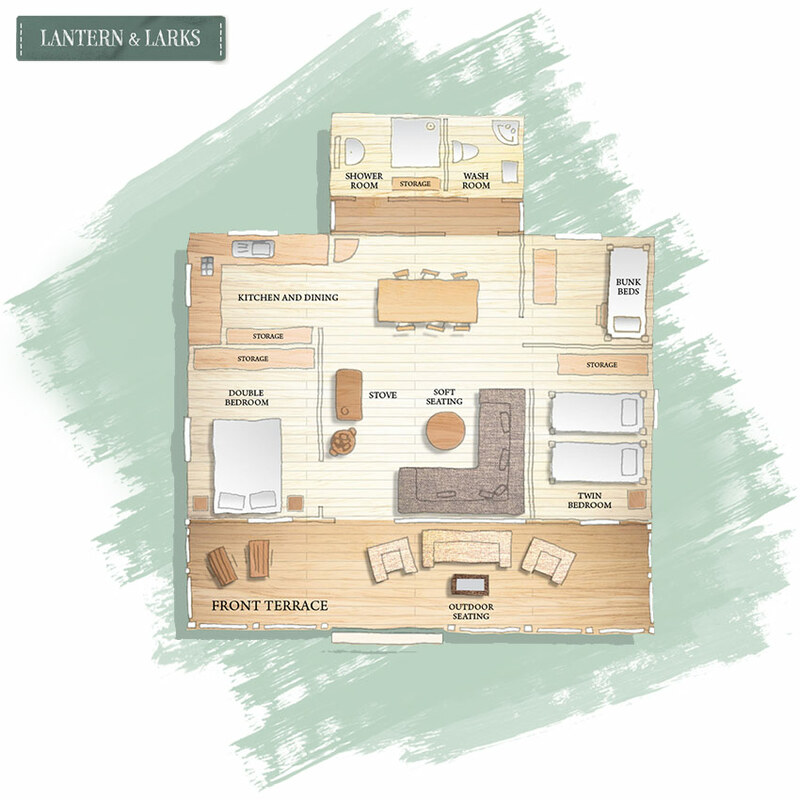 Your Lantern & Larks home from home is a canvas-wrapped three bedroom rural hideaway, and will sleep six in complete comfort. But if there are four people or fewer in your party, we are pleased to reduce the price by 15% during low season. Our prices include all bed linen with the beds made up on arrival, bath towels, hand and tea towels. The use of your own firepit/bbq plus unlimited wood for the duration of your stay is included in the price. There are no hidden costs, the price you see is the price you pay. Home cooking takes on various forms. The kitchen has a butane hob for copious cups of tea - ideal for simple meals or a stir-fried treat. Simmer an all-in casserole on the wood burning stove or outside on the firepit. All the bedrooms are roomy and separated for privacy and comfort. The tent has one double; one twin; and lovely bunked bed fun in the third for toddlers or teens. All beds are solid pine with comfortable mattresses and plush duvet sets throughout. The tent has ample room to lose holiday clutter and to hang, stack and drawer clothes and toiletries too. Gather the family around the fire pit, on your decked terrace and get comfortable on the stylish cane outdoor sofa and armchairs, barbecue to your heart's content with local produce cooked to taste on the intoxicating ballet of flames. On a Lantern & Larks holiday, your garden is whichever delightful slice of the British countryside you choose to stay in. Each tent/site will be situated in a peaceful corner of private land or farmland, making the most of the local flora, fauna, tranquillity and views. Explore the locality, the village life, footpaths, the sounds and sights. Then sample the broader highlights of the area's woodland, moors, coastline, towns, hills and valleys, waterways and lakes, its country houses and the many varieties of regional treasures that gave us reason to light our special lantern here.